One of the active members in our Facebook Community, Frannie Gay, decided to put away the stoplight at the end of school two years ago. So with last year under her belt, she was open to sharing some of the reasons behind her move and the strategies she’s used in place of the stoplight. Frannie has taught kindergarten, first, fourth and fifth grades in both Title l and Non-Title l schools. She currently teaches kindergarten in South Carolina. Frannie used a stoplight system for years, as well as a similar system for older grades called “the yardstick.” She used both flexibly… children were always allowed to move back up from their current level, but Frannie was still uncomfortable with the systems. So Frannie found herself using the systems less and less and creating individual plans for children who struggled. After finding similarly-minded educators online and a flexible administration at her current school, she decided to abandon the stoplight. BTS: What strategies do you use in place of the stoplight? We talk about how we want our class to be, develop a “code of cooperation”, and show examples of what those expectations look like. When it comes to behavior, my hope is to help students manage themselves. Since I teach kindergarten, the students don’t necessarily have experience with a stoplight yet, so they just learn that this is how it is in our room. In place of a stoplight, we create classroom expectations together (which I have always done, even with the stoplight) and describe explicitly what those expectations look like throughout our day and our school. 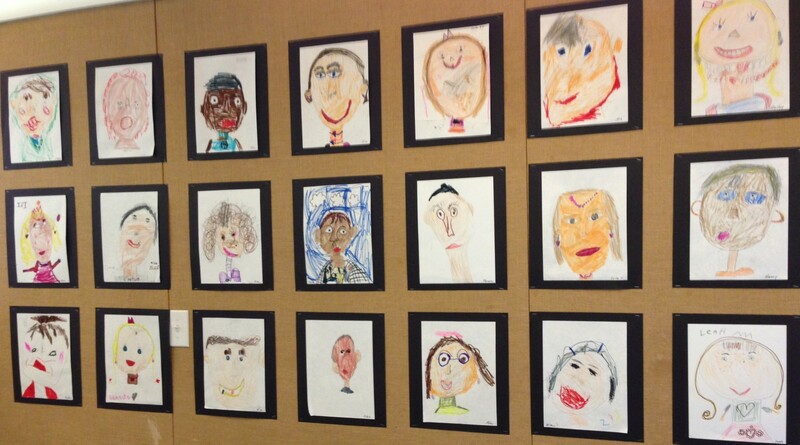 I use children’s literature to discuss classroom behaviors, relationships, and feelings. When expectations are not met, logical consequences are used. In addition to logical consequences – we call attention to positive behaviors, use one-on-one conversations and personal behavior plans when needed. This year, I have implemented a “calm down” spot. The “calm down” area is specifically for times when a student needs to gain control over his/her emotions and has not “broken a rule”. 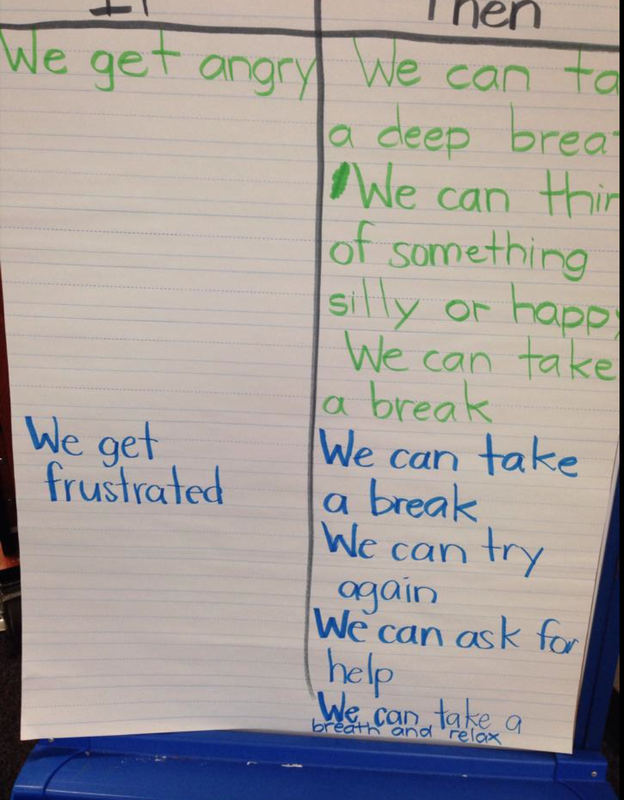 In preparation for the “calm down” area, we read different books about feelings and created an if/then chart. I rely a lot on the Responsive Classroom techniques. This year, we did activities to practice self control and I remind them of this daily – we need to use our self control – with our voices (too loud), with our hands (touching things at inappropriate times), or with our bodies (being in others’ spaces), etc. BTS: How do others view your decision not to use a stoplight? I honestly do no know how many colleagues realize that I do not have a stoplight system in my class. I post a lot of articles on Facebook and twitter. A friend I used to teach with did let me know this summer that she would not be having a stoplight in her classroom. I cheered! Then during preplanning, a second grade teacher said that my posts inspired her and that she ripped down her stoplight earlier that day. I also cheered for that! I am not the type of person to criticize what another does – I just share the successes we are having and hope it inspires someone. BTS: How did you feel as a teacher, making the switch? When I decided to make the change, I was nervous. Although I knew I didn’t have to have a stoplight specifically, I thought I might get into “trouble” for not having a visible system. I was nervous because I tend to be a control freak. I was nervous because the class was a challenging combination of behavior issues. And, honestly, I felt like I had no idea what I was doing! I felt excited because I was embracing something I had been wanting to do for a while, and I finally felt safe and comfortable enough professionally to do it. I felt excited for the possibilities and excited that feelings I had about the stoplight system were being validated by other teachers and by research. BTS: What was the biggest challenge to moving away from the stoplight? The biggest challenge was me. I needed to truly relinquish control to the students regarding their behavior. At times, I wondered if I had made the right choice, wondering if only the student could “see” where he/she stood behavior wise for the day perhaps he/she would make a better choice. But that wondering was short lived. I quickly would remind myself that it never worked. 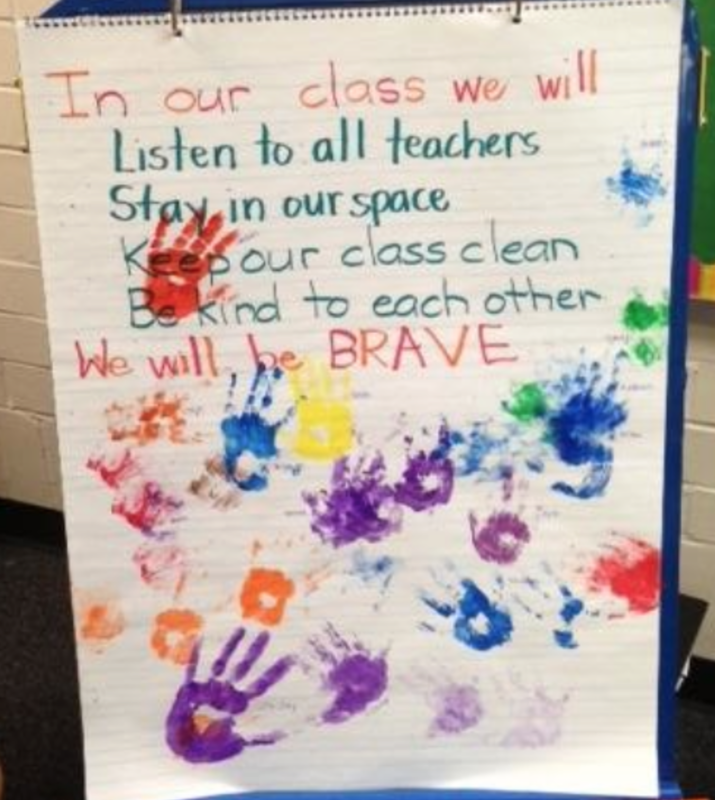 BTS: What has not changed in your classroom? What has not changed is the fact that I build a relationship with my students and their parents. I tell my parents at orientation, the first thing your child will learn from me is that I love them. I take that seriously – although to some, I may look like a softy. I consider where a child comes from before he/she gets to school and use that information. This year, my class is completely different than last year – as they always are. I feel more confident in myself and embracing my classroom without a stoplight. BTS: What advice do you have for other teachers? My advice to other teachers is to just jump in! It is like wanting to get in the pool and knowing the water is cold. You just have to plug your nose and jump in the deep end! Bravo! I’ve read this a few times and love it. It’s nice to hear from a teacher who left the stoplight.